The outlook for science has never been brighter -- we know more today than ever before about the molecular basis for thousands of diseases that impact millions of patients -- but the outlook for funding has also never been bleaker. With the National Institutes of Health losing a billion and a half dollars to the sequester, traditional investors retreating from early-stage life sciences, industry pipelines shrinking, and philanthropy unable to fill the gap, we are poised to leave a huge scientific opportunity on the table, namely our ability to get important new medicines out of the lab and to patients more quickly. And with millions of lives hanging in the balance, it's just not something Americans can afford to do. 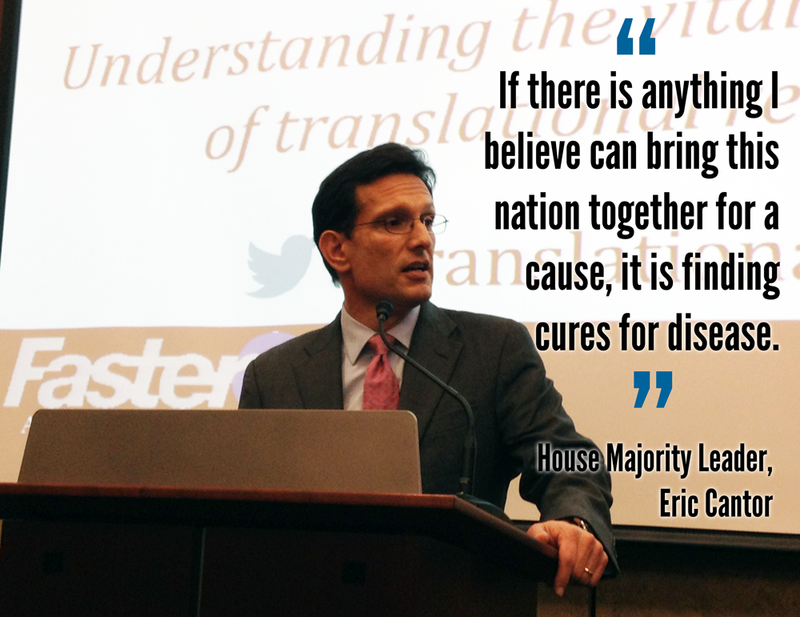 FasterCures hosted over 100 congressional staffers, patient advocates, academics and drug developers at a Capitol Hill briefing about the importance of federal support for translational research, the phase of medical R&D between the birth of a basic scientific discovery made in the lab and when a pharmaceutical company tests out a potential new therapy with patients -- or, more plainly put, "the stuff in between" microscope and marketplace. It is good to be about cures. Disease touches us all, and as compassionate humans we should all care about improving and saving lives. It is good for the economy to invest in research. This leads to job creation and global competitiveness. It is a good way to bend the cost curve of health care. We have mounting deficits and debts, and we should prioritize the allocation of funds to areas like this that have the greatest impact. "This is really an engineering problem," said NIH Director Francis Collins. "It's about taking a pipeline that is too long and too leaky and fixing it." With each new therapy that comes to market taking up to 15 years to develop and costing over $1 billion, it's more challenging than one might think to successfully navigate the translational stage. There is great momentum in science, and we are poised to start solving several of these problems, particularly with the existence of the new National Center for Advancing Translational Science (NCATS) at NIH, but if we don't continue to invest, we risk losing not only time and lives but a significant driver of economic health. "NCATS is a unique new entity, purpose-built to solve this central paradox: that we know more than ever before about how the body works and what goes wrong in disease but lack the equivalent ability to fix it," said NCATS director Chris Austin. "We're designed to be perpendicular to how the rest of NIH works, and to focus not on what's different about disease but what is common." He went on to describe the institute as a biomedical equivalent to the Internet, focusing not on creating companies or products but on allowing people with ideas to share them in a more productive way, and de-risking investment by other sectors in this translational space. 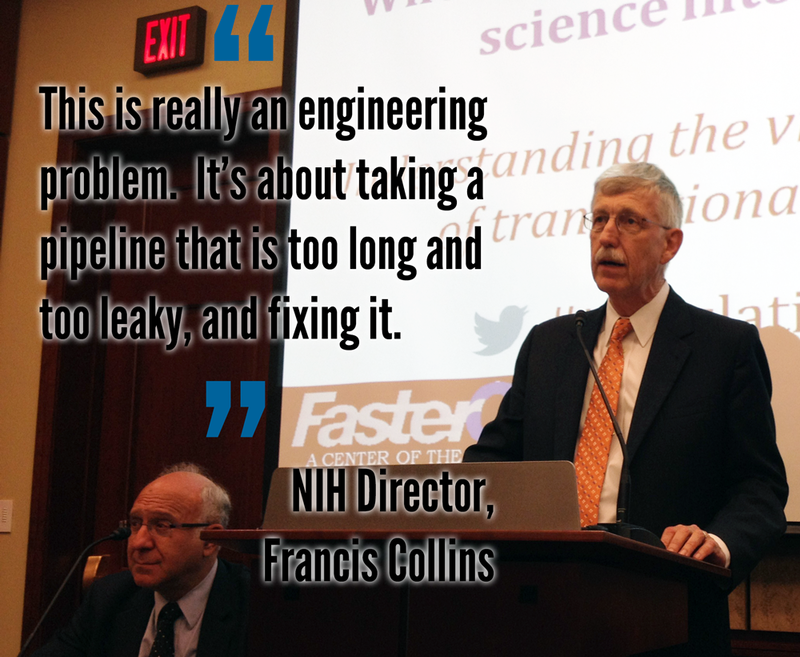 Both Collins and Austin said that there is no better time to pursue translational research. Today, we know the molecular causes behind 4,500 diseases, yet there are drugs available to treat just 250 of them. "We are operating on hope, not hype," said Sharon Terry of the Genetic Alliance. "The network solutions that have overtaken other industries and streamlined them are finally starting to hit the biomedical research space, and we can't afford to lose momentum." She specifically referenced networked programs such as the Clinical and Translational Science Awards at NIH that are significantly advancing systems improvement in the translational phase and are primed, with the proper support, to foster more integrated research across communities. A new report released this week by the Institute of Medicine goes into more detail. "Industry can't do it alone. ... Companies depend on basic science coming from the NIH," Simeon Taylor of Bristol-Myers Squibb said. He described how Big Pharma relies on the basic science discoveries made early on in the lab to develop drugs for patients who need them so desperately. Just last week, BMS, along with eight other companies, provided 58 compounds for an NCATS pilot program called Discovering New Therapeutic Uses for Existing Molecules, designed to develop partnerships between pharmaceutical companies and the biomedical research community to advance the development of therapeutics. I had the privilege of moderating this discussion. The message that rose the top was clear: Getting a therapy from discovery to patients requires partnership and collaboration across all sectors in the medical research ecosystem: scientists, regulators, industry, investors, and, most importantly, the patients themselves. An effective R&D system is an efficient one, but reengineering the system in the way we know is possible requires support, and with funding at critically low levels, the ripple effects could be devastating. If we are to improve our odds for success for our patients and for our economy, there is no time to waste.